Yangon Region Chief Minister, U Phyo Min Thein, addressing regional government staff and representatives from the EU and International IDEA. Image: Thet Htun Aung. Although Myanmar held successful national elections in 2015 and by-elections in 2017, municipal elections lag far behind. The city of Yangon is yet to hold fully democratic elections and the electoral legal framework has not been updated since the colonial period. In this context, a two-day workshop and drafting session with the Yangon City Development Committee (YCDC) on electoral reform on 26–27 October marked a breakthrough in municipal democratic reform. One of the major decisions from this workshop was a commitment by drafters to shift voter eligibility from one vote per household to universal suffrage. 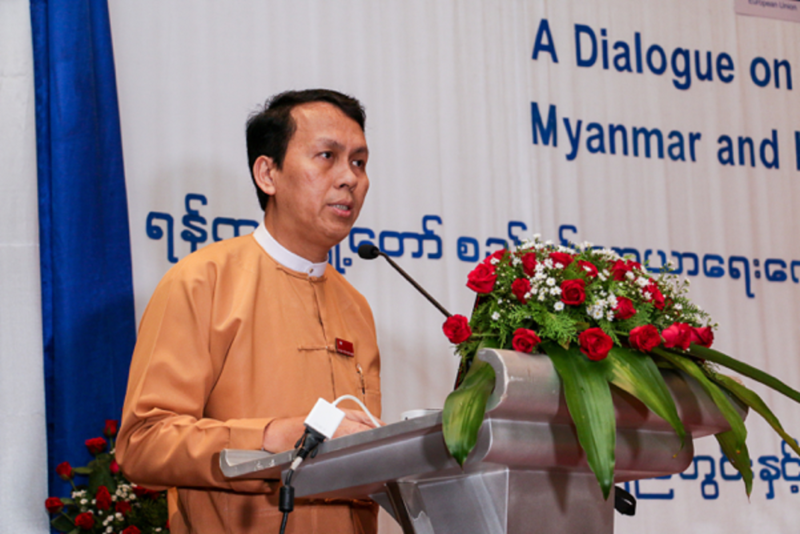 As part of the EU-funded STEP Democracy programme, International IDEA organized a workshop with the Chief Minister of Yangon Region, U Phyo Min Thein; the Yangon Regional Parliament; and YCDC officials, to discuss and analyse the municipal electoral system. The workshop provided a platform for participants to share their recommendations and concerns regarding the current system. It also served as an opportunity for participants to begin the drafting process for electoral reform. Participants were particularly interested in discussing voter lists and candidacy eligibility. They also discussed ways to encourage voter turnout and participation from historically marginalized groups, such as women and ethnic minority groups. International IDEA also presented on topics of special interest, such as campaign finance, voter lists, and candidacy eligibility. Frank McLoughlin (Programme Officer, International IDEA Stockholm) and Saket Ambarkhane (Programme Officer, International IDEA Naypyidaw) addressed the existing academic literature and international standards on these topics. Both stressed the importance of transparent and collaborative stakeholder consultation in electoral reform and the need for electoral systems that are appropriate for the local context. Reflecting International IDEA’s belief in comparative learning, McLoughlin and Ambarkhane listed examples of global best practices in stakeholder consultation. Ambarkhane shared how, in India, any suggested changes to electoral laws or by-laws are shared in a monthly national publication in multiple languages, inviting public input. This collaborative process allows for information on potential changes to be disseminated in a transparent and accessible manner. It also reduces the risk of challenges to the legitimacy of election results. The main message distilled from McLoughlin’s presentation, which focused on stakeholder consultation in Canada and the Philippines, was that despite differences across countries, all good consultations methods share a common feature: they are contextually appropriate to encourage and maximize stakeholder participation and engagement. Participants left the workshop with valuable insights on best practices in electoral management and ideas on how to make Yangon’s municipal election system more democratic and inclusive. International IDEA will hold follow-up sessions and workshops with participants responding to the issues raised over the two-days.